Alice is survived by the love of her life Dennis Dineen, two brothers: Richard Lockhart (Beatrice) of Perth Andover, N.B. ; Dan Lockhart (Joan) of Woodstock, N.B. ; two sisters: Carol Andersen (Ray) and Lee Longstaff of Bairdsville, N.B. 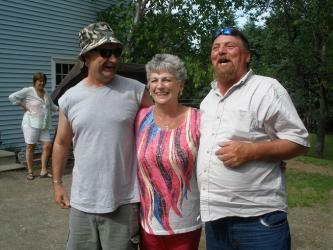 ; sister-in-law Polly Lockhart of Easton, Maine USA; Brother-in-law and Sister-in …law : Kevin Dineen and Linda Craig of Huntingdon, Quebec. Several nieces and nephews by whom she was known as a beloved “Aunt Allie”. Alice spent her working career doing something she truly enjoyed and loved ---the transport industry as an Agent for McAuley’s Transfer Ltd., Centreville, New Brunswick. An informal celebration of Alice’s life will take place at the Centreville Elks Club, Centreville, New Brunswick on Saturday, February 16th from 2 p.m. to 4 p.m.